News recap: Organizations demand justice in wake of assassinations and ongoing violence in Ixquisis, TAKE ACTION to stand with communities working to protect community consultations, NISGUA Speaking Tour shares lessons from successful organizing in Chixoy-Copón Rivers Watershed, KCA sues Guatemalan State in international court, survivors of sexual violence in Military Zone 21 Case continue struggle for justice, NISGUA welcomes new Communication Fellow, NISGUA celebrates 11th annual benefit dinner with the Guatemala News and Information Bureau. 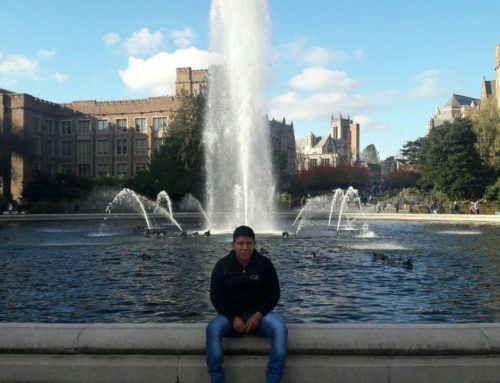 On December 16, two members of the Peaceful Resistance of Ixquisis, brothers Neri and Domingo Pedro Esteban, were shot and killed. Their bodies were found near the site of one of the three hydroelectric dams that Energía y Renovación, S.A. has violently imposed. 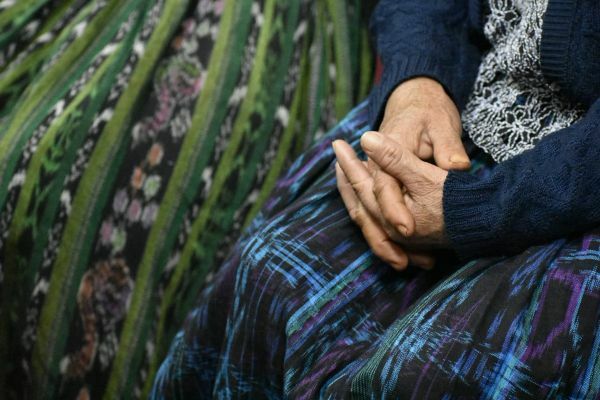 Their murders are part of a larger pattern of attacks, defamation, militarization, and impunity for human rights abuses in the Ixquisis region. 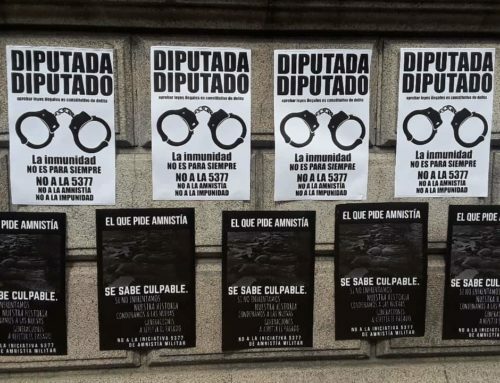 More than eighty incidents have been documented this year alone, including a recent attack against Lucas Jorge García, president of the Second Level Development Council of the Ixquisis Region, and his daughter María Gómez and daughter-in-law Ana Gómez Domingo. In response to the ongoing violence against the Peaceful Resistance of Ixquisis, more than 100 national and international organizations published a letter denouncing the violence, calling for a thorough investigation, and demanding security guarantees for the environmental defenders of Ixquisis, among other petitions. You can read the full letter in Spanish or English. In a 2009 good faith community consultation in San Mateo Ixtatán, communities rejected an extractivist model of "development." The consultation included communities from the Ixquisis region who added their voices to the resounding NO! rejecting hydroelectric and mining projects in the region. TAKE ACTION to stand with communities working to protect community consultations! NISGUA's fall tour partner, ACODET, is seeking signatures for their public statement regarding the current threat against the ancestral decision-making practice of community consultations. Read the statement & sign in support today! This November, through our speaking tour, “How to Stop a Dam with Indigenous Resistance,” NISGUA facilitated direct exchanges between Maya Mam water protector José Gómez of ACODET and Indigenous organizers in the U.S. ACODET has led a successful movement to stop the construction of the Xalalá Dam for over a decade. We’re grateful to all of the organizers who helped us create spaces for José Gómez and other Indigenous leaders to share lessons on defending water, land, and Indigenous rights and identity. Read our tour report-back and specific coverage of our stops in Seattle, Las Cruces, and the SOAW Border Encuentro in Nogales, Mexico. 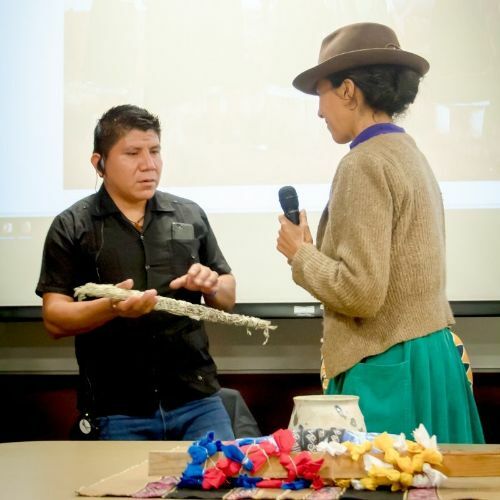 In Las Cruces, Claudia Montesinos, a water protector who has organized at Standing Rock and in Honduras, presents José Gómez with a gift of sage harvested at Standing Rock. The International Centre for Settlement of Investment Disputes (ICSID), the World Bank’s international arbitration body under CAFTA, has accepted Kappes, Cassiday, and Associates (KCA)’s case against the Guatemalan state. The company is demanding $300M for profits allegedly lost from the El Tambor mine suspension. CAFTA arbitration has been infamously used in El Salvador by transnational corporation Pacific Rim, who unsuccessfully attempted to circumvent popular and governmental opposition to metal mining. 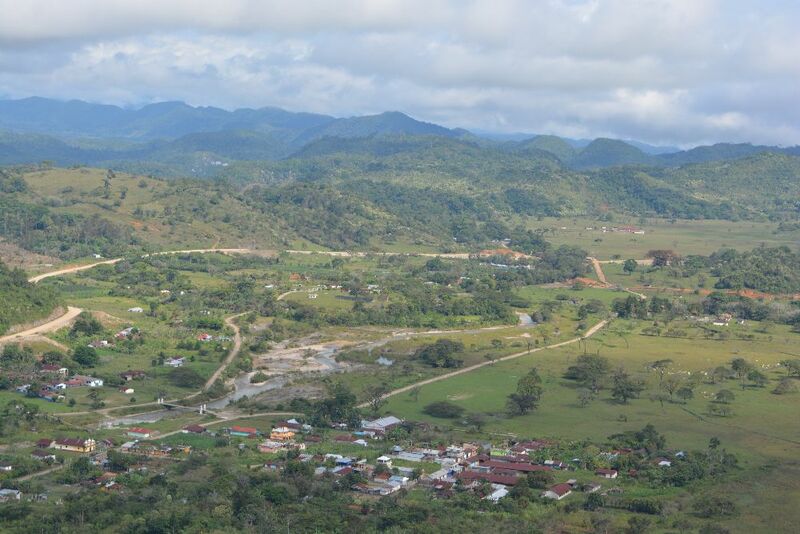 For nearly seven years, the Peaceful Resistance of La Puya has worked to prevent silver and gold mining at El Tambor, citing KCA’s failure to consult affected communities and the devastating environmental impacts of the mine. The communities successfully used peaceful encampment strategies at the entrance to the mine, but have faced violent attacks, intimidation, and threats of eviction. NISGUA and other international organizations stood with communities, which successfully halted mining operations in 2016. In response to this latest move to try to impose the mine against community will, the Peaceful Resistance of La Puya held a press conference, calling on KCA to leave the country and reminding the Guatemalan state that its responsibility is to look out for the well being of its communities. More than two years ago, Judge Claudette Domínguez sent eight former military officers to stand trial in the Military Zone 21 case. However, Domínguez excluded important evidence and charges against them. The excluded evidence included testimony on systematic sexual violence by the military. 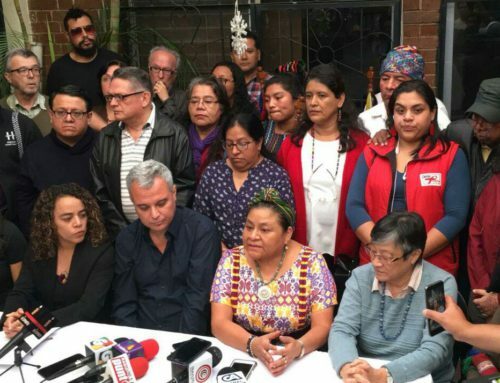 On December 14, plaintiff organizations sought to rectify her decision, appealing to Guatemala's Femicide Court to call on Domínguez to include sexual violence in the charges of crimes against humanity. NISGUA is thrilled to welcome our first fellow, Claire Bransky. 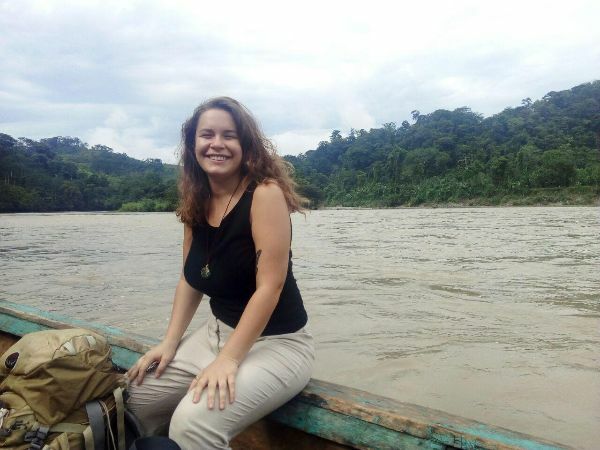 Claire, a former accompanier in the Ixil and Ixcán regions, is joining us as a Communications Fellow. Check out her blog article on the lessons that defenders of life teach us about human rights. 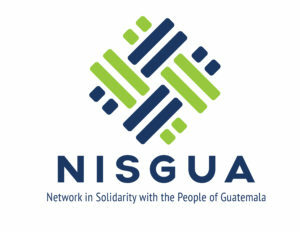 On December 3, NISGUA hosted its annual benefit dinner with the Guatemala News and Information Bureau (GNIB). Over a hundred NISGUA members came to Platano Restaurant in Berkeley to hear from NISGUA friend and longtime collaborator, Maya Kakquikel photojournalist and documentary filmmaker Rode Díaz. Rode spoke about his work documenting and participating in Guatemalan social movements. He also shared about his recent work documenting the lives of Central Americans living in sanctuary churches in North Carolina while facing the constant threat of arrest and deportation by ICE. Reflecting on the connections between these two areas of his work, Rode underscored love as the common denominator across all forms of struggles and solidarity, and called on NISGUA to continue to center love in its organizing. 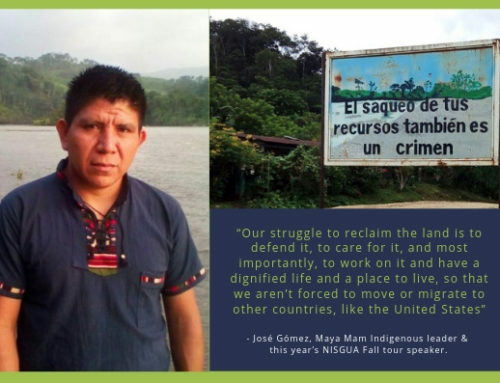 In a year of repression in Guatemala and the U.S., NISGUA was proud to stand with communities organizing to call for justice, to protect the environment, and to demand the right to self-determination. 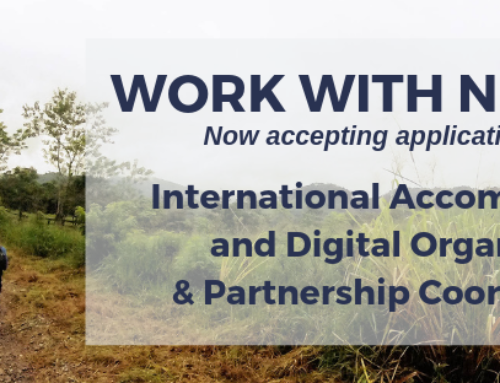 NISGUA created opportunities for communities in the U.S. and Guatemala to mutually resource themselves through cross-border exchanges. We thank you for your support in this year of resilience, mutual strengthening, and struggle.